Long known for its historic homes and colonial tavern, Haddonfield is about to make its historic dinosaur a town icon. HADDONFIELD, N.J. -- A civic committee organized by the Haddonfield Garden Club and blessed by the borough government plans to erect a statue of a dinosaur in the downtown business district. The approximately 15-foot-long bronze sculpture will commemorate Hadrosaurus foulkii, the historic dinosaur fossil dug from a local marl pit in 1858. That 19th-century discovery was a landmark event in the history of paleontology. 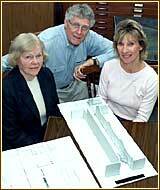 Jan Twitchell, Don Jackson and Beverly Aldeghi (left to right) with a Dinosaur Committee planning model of Lantern Lane. garden in the middle of Lantern Lane. The Lane is a pedestrian walkway connecting the business district's main parking lots to Kings Highway, the town's central traffic artery. The committee, which calls its project "HATCH" (Haddonfield Acts to Create Hadrosaurus foulkii), is about to begin a drive to raise the funds needed for the project. "Community feedback to the idea has been very positive," said committee co-chair Jan Twitchell. "The general consensus is that the idea is excellent. The three borough commissioners have given it their blessing. And the Haddonfield tourism organization has invited us to their meeting. They are doing all they can to promote the town and they were very much in favor of this project." "The only negative comments," said Twitchell, "have been about the size of the sculpture," she continued. "Some people have expressed a desire to have a life-sized version of Hadrosaurus foulkii that is very child-accessible. But that just isn't realistic for the size of the Lantern Lane site." "We believe this will be beneficial for Haddonfield for several reasons," said Twitchell. "It will create a unique and memorable meeting place for visitors to the business district. In much the same way that people used to say, 'Meet me at the eagle,' in the old Wanamaker's store, we want them to say, 'Meet me at the dinosaur,' in Haddonfield. "The sculpture and garden will make Lantern Lane a more memorable and attractive entry into the downtown business district," she said. "And it would be educational. We hope to have information at the sculpture that would provide a sense of Haddonfield's unique role in the history of paleontology and point them to Web sites, libraries and museums where they can learn more about the subject." The sculpture and the publicity generated by its creation and placement is likely to make Hadrosaurus foulkii a new icon for a town that was previously best known for its pioneering historic preservation policies, its historic homes and its 250-year-old colonial tavern. The drive to erect a dinosaur memorial in the downtown business district began quietly two years ago when the Haddonfield Garden Club was replanting Lantern Lane with shoulder-high grasses. In the midst of that project, members were discussing a way to visually improve the stark cinderblock wall that runs along much of one side of the pedestrian walkway. The subject of Haddonfield's dinosaur had been the topic at a recent party attended by club members. "We started brainstorming and before the day was over we came up with the idea that it would be wonderful to have a statue of our historic Hadrosaurus foulkii on Lantern Lane to really change the way the Lane looks," said Beverly Aldeghi, Garden Club president. Led by Aldeghi and Jan Twitchell, the co-chairs of the current Haddonfield Dinosaur Sculpture Committee, the group presented the concept to Mayor Tish Colombi, who tentatively approved. Then, dubbing its project HATCH, the group spent much of 2001 organizing the preliminary research and planning required to utimately fund, design, construct and place a 12-foot-long bronze dinosaur sculpture of in a garden-like fountain environment in Lantern Lane. This year, they kicked the project into high gear, expanding the steering committee that now includes Mayor Colombi as a member, and preparing for a major fund-raising and promotional effort. "We started meeting on a weekly basis in January and aside from the 12 committee members, we now have more than 90 volunteers who have offered to help," said Aldeghi. The plan is to select and commission a sculptor, raise the needed funds and complete the design for the fountain garden and its plantings this year and then declare 2003 as Haddonfield's "Year of the Dinosaur." "We hope that at First Night (New Year's eve) at the end of 2002, we will be able to declare the beginning of the Year of the Dinosaur." "2003 is 145 years from 1858, the year of the scientific discovery of Hadrosaurus foulkii, and that anniversary gives us something to work with," said Twitchell.